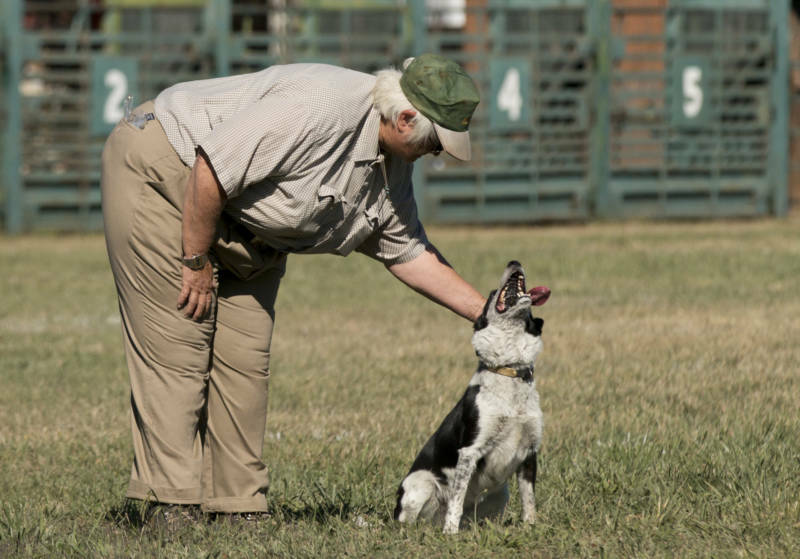 Football season might be in full swing and baseball is hitting the home stretch, but there's another sport capturing the attention of people in Northern California: sheepdog trials. 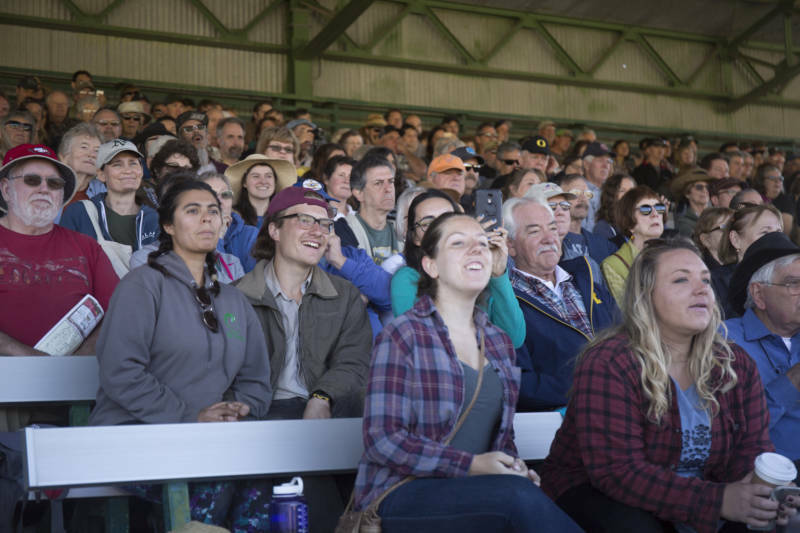 Earlier this month, hundreds of people gathered at the Mendocino County Fair and Apple Show in Boonville to watch the annual sheepdog trials. The herding event is a competitive dog sport that dates back to the mid-19th century in Europe, New Zealand and Australia, in which highly trained herding dogs move sheep around a field, fences, gates or enclosures as directed by their handlers. 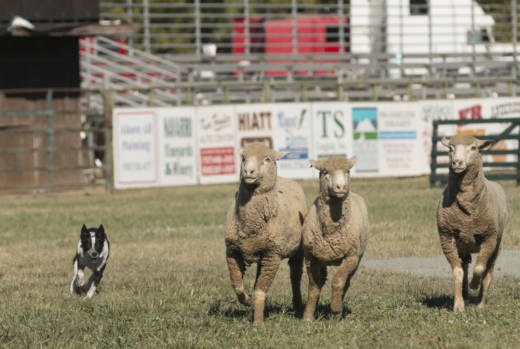 The sheepdog trials in Boonville took place in a field at the county fairgrounds where the local high school plays football games and the rodeo takes place every year. There are four obstacles on the 100-yard-long grassy arena: a square pen, two gates side by side with a 6-foot-gap between them and a plywood chute that looks like a large funnel. 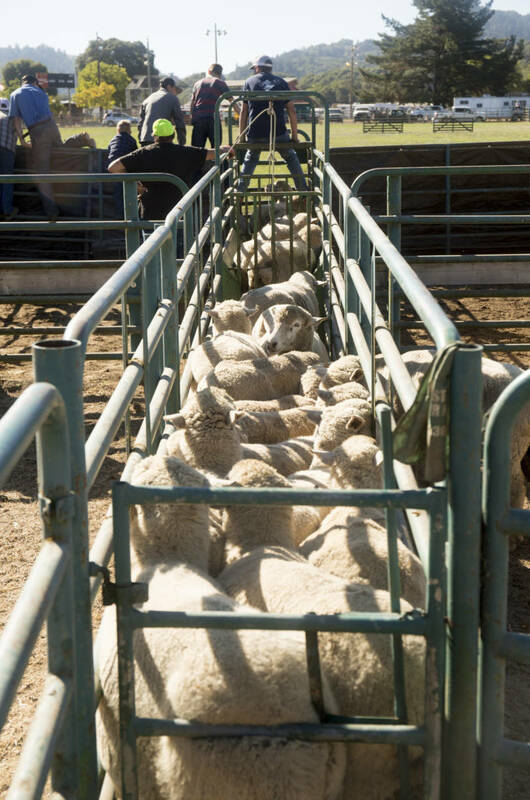 The sheepdogs have to get the sheep to enter the funnel and squeeze through the dark chute, which is only 18 inches wide for most of its length. The chute is often many-a-sheepdog’s Waterloo. 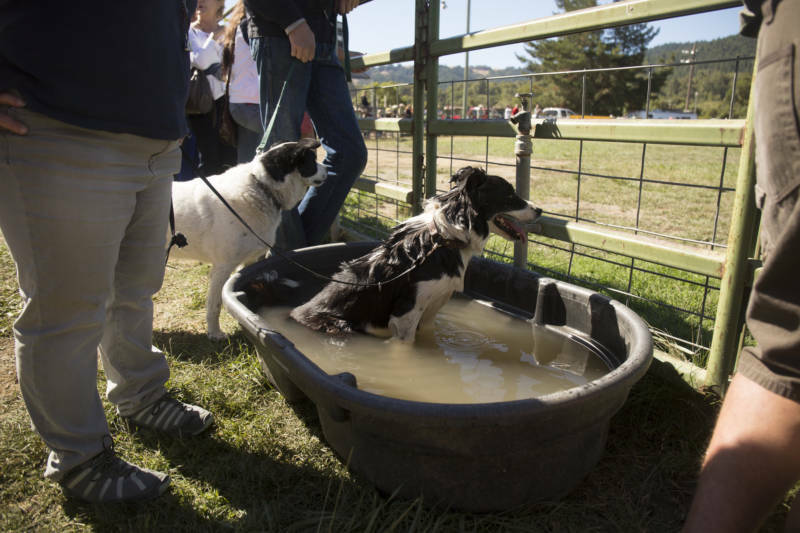 KZYX broadcasts the sheepdog trials live every year, with sports commentary from Woelfle and Kevin Owens, who is a multiple-year winner of the Mendocino sheepdog trials. “I think that we are the only radio station in the world that does this. I've never heard of another station broadcasting sheepdog trials live with commentary,” Woelfle says. This type of sheepdog trial is unique to the Redwood Empire region of Northern California because of its rough terrain. It was developed because sheep ranchers in the area needed dogs to help round up sheep from places that people and horses could not easily access. In these trials, gripping is permitted, where the dog gives the sheep a tiny nip or pinch. This is because in the steep terrain and canyons of Northern California, if a stubborn sheep doesn’t want to move, the dog will often need to use this technique. Karen Kollgaard, 76, won the trials last year with her dog, Dickens, and has been participating in the trials for nearly 40 years. Her first competition was in Mendocino County. This year, she won fifth place with her young dog, Timbre, a 26-pound border collie full of energy. Kollgaard says that ranchers often have to talk to their dogs from nearly a mile away, so they use whistles and voice commands to direct their dogs over large distances. She says “left” and “right” sound similar — they’re both one-syllable words — so handlers usually use “come by” for the left signal and “away” for the right signal. Contestants are judged on how efficiently and calmly the dogs work the sheep and how many obstacles the sheep go through in 10 minutes. No hand signals are permitted in the trials, only voice and whistle commands. This is because hand signals might distract the dog or sheep or be confused with aiding the dog in herding the sheep through obstacles. Kollgaard says ideally the sheep, who usually see the dog as a predator, will begin to trust the dog if its technique is calm and precise and then will go quietly where the dog tells them to go. “The best runs look like you’re what we call ‘Bo-Peeping,’ which means the sheep are just sort of following you along as if they were trained to do so when they really aren’t. But because the dog is working that efficiently and quietly, it looks like they are,” Kollgaard says. This year's winner was Donna Beebe, with her red-and-white border collie, Meg. Beebe grew up in Boonville, and her family helped start the Redwood Empire Sheepdog Association, which organized the competition. "I come from a ranching family," Beebe says. "My father was a sheep herder right here in Mendocino County, so we always had 20 border collies in the yard." There are rural sports all over the world — sled dog racing, logging sports and even wool sack races in England. Woelfle says these sports originated from actual jobs people do, and that's worth celebrating.